Mister Ron purveys a brand of content that is more than just the story. The stories are great. I love this old humour not just because it's funny, but the zeitgeist of the era becomes so alive. But Mister Ron is a talented stylist in his delivery. Like a great jazzman he brings his signature voice and phrasing to each piece. 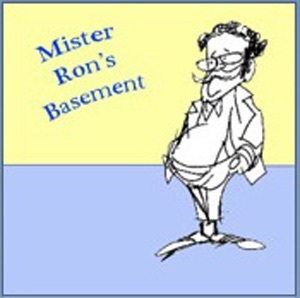 Clearly formed by the anachronistic wild frontier of the mind expanded sixties, Mister Ron has honed his "voice" to clearly make the content not just sing, but entertain with his happy and amusing touch. I love it for the cadence as much as the content. Refreshingly unusual selections and wonderful accompanying old music... But Evry's curiously smug, impatient, rapid-fire reading is extremely annoying and downright difficult to listen to. It sounds as if he's deliberately emphasizing the wrong words, robbing the old texts of meaning (or else just having fun at their expense); and though one would assume Evry must have a reverence for these little-known sketches and tales that entertained earlier generations of Americans, he hurries through them with the disdain of someone dictating as fast as he can before a connection goes dead. Mister Ron's readings are a delight, especially the "George Ade weekends." Just can't get enough of those witty fables. I'm so glad that Mister Ron's Basement is out there. It offers meaningful content delivered with a soothing and charismatic voice. I always enjoy listening. I love listening to these podcasts because they bring the spoken word alive for me. These podcasts bridge a by-gone era with the modern day, reminding us of all the foibles of being human -- giving us a chance to laugh at ourselves anew. Ron Evry has a radio presence filled with warmth and enthusiasm. In another age we would never have been exposed to his storytelling abilities. In this age, his gift is accessible to all. I'm having fun researching and recording these stories, and getting feedback from listeners. Thanx and a tip o' MisterRon's hat to all of you!